As part of the series of posts announced at this initial blog post (.NET Application Architecture Guidance) that explores each of the architecture areas currently covered by our team, this current blog post focuses on introducing the new "Modernize existing .NET applications with Windows Containers and Azure" eBook which you can download here. When you decide to modernize your web applications and move them to the cloud, you don't necessarily have to fully re-architect your applications. Re-architecting an application by using an advanced approach like microservices isn't always an option, because of cost and time restraints. Depending on the type of application, re-architecting an app also might not be necessary.
? Which apps require a transformation or re-architecting.
? Which apps need to be only partially modernized.
? Which apps you can "lift and shift" almost directly to the cloud. The last two cases are precisely the focus of this subject (LIFT and SHIFT scenarios). Lift and shift is the action of moving a workload to a newer or more modern environment without altering the application's code and basic architecture. The main subject of this guidance is about "Cloud DevOps-Ready" apps, where the main focus is to use WINDOWS CONTAINERS, how to containerize your existing .NET Framework application (monolithic, N-Tier, etc.) 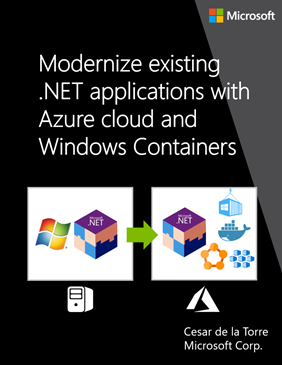 and how to deploy your Windows Containers into Azure. Remember that this 'LIFT & SHIFT' guidance, explained at this blog post, is part of a broader .NET Architecture guidance which covers additional subjects and you can check out at the .NET Application Architecture Center page where you can download the multiple eBooks/Guides and visit the reference applications from there.